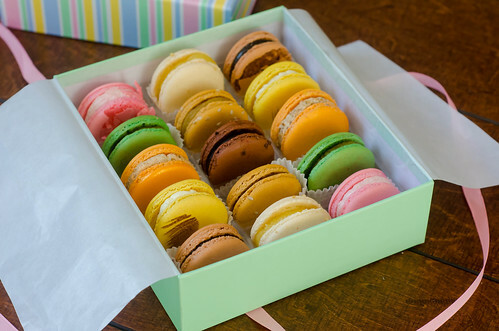 Pink Parsley: Sucre´ Macarons Giveaway! I took a trip to New Orleans in college, and when I think back, it was kind of a waste. I definitely didn't take advantage of the amazing local cuisine and shopping... what can I say, I had different... priorities back then. However, I'd love to visit again, and I already have a list of places to eat/drink/shop. 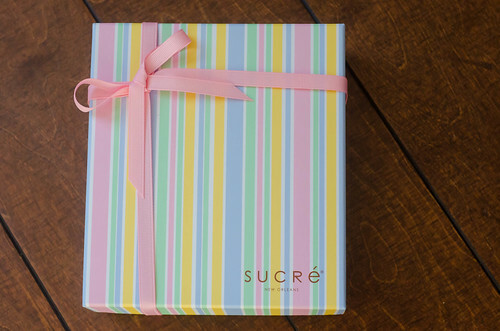 Sucre´ is definitely at the top of the list. It's a sweet shop that offers all sorts of chocolates, candies, confections, and macarons. When I was first contacted to host a giveaway, I got lost on their website looking at all of the offerings. Chocolates in every imaginable flavor and combination, handmade marshmallows, caramels, gift baskets, and beautiful macarons. I absolutely love macarons. I received a box of their signature collection, and I'm not exaggerating when I say that they were gone within two days. Every time I ate one, I proclaimed it to be "my favorite." So they were all super tasty, but the standouts for me were the strawberry, bananas foster, carrot cake, and almond. I had initially planned to eat 1-2 by myself, then take the rest to my mother-in-law's for Easter. But they didn't last long enough. Sorry, not sorry. So on to the giveaway: Who wants to win some macarons? I'll be giving away a box of their 15-piece Signature Collection to one lucky reader! To enter, answer this question: What city do you wish you could re-visit? New Orleans and New York are definitely at the top of my list! US residents only - sorry! You must leave a valid email address to be eligible. Giveaway closes Friday, April 26th at 11:59 pm. Winner will be chosen by a random number generator. This giveaway is sponsored by Sucre´. I received a box of the macarons from them, but all opinions are my own. I want to revisit Chicago. We only got to stay for a short period of time and I would love to see more of the sights. I would re-visit San Francisco but, this time with Brian in tow. The food, the wine, the crusty bread. Mmmm. This is going to sound really staged, but I would love to revisit Boston. My husband was unable to go with me, and I want to take him there some day. I think he'd love it. Definitely Portland, Oregon. So much character and individuality. Always something new around the corner makes for a great adventure! I grew up in New Orleans and lived several decades in New York but I would love to revisit Edinburgh in Scotland; so beautiful and fun and alive. Funny you should mention New Orleans, because that would be my choice too! I never really got to visit, but I passed through on a train ride and wish I could have had time to roam around the city. I love NY, adored New Orleans, experienced San Antonio, but can't wait to get back to Jerusalem. The old world meets new world feeling between the walled city and the modern city amazes me. Love the culture, the people, and the food! I'd love to revisit Los Angeles. My brother and sweet nephews live there, and my hubby & son have never been. I'd love to revisit Washington DC! I would love to go back to Paris! I would love to try macarons! I LOVE macarons! I wish I could revisit Rome. I really loved that city and Italy in general. I've never had a macaron..I think this needs to be remedied. I would love to re-visit New Orleans, and Savannah. I love southern charm! New York...I went in college and need to soak it up as a true adult. Definitely New Orleans. It's my dad's hometown, but I haven't been back since I was in college. I can't wait to show it to my kiddos! I can't wait to re-visit Florence, Italy. One of my favorite places when I studied abroad! New Orleans...it's my dad's hometown, but I have not appreciated it as an adult yet! Limerick, Ireland where I studied for a summer! My husband and I would just LOVE to go to Ireland and Italy sometime. I definitely need to go back to Austin, such a fun foodie city! I definitely need to go back to NYC--I went in college but didn't appreciate it really! Florence, Italy. I'm ready to eat my way through that place again! What a great giveaway! My dream city to go back to is Salzburg, Austria! Stateside, I would love to go back to Savannah, GA. Haven’t been is such a long time. Oddly, my hometown, San Diego. I always took for granted the idea that I could go wander around there whenever I wanted, and I never really did. Now that I only go back once a year, I realize how much of the downtown, museum scene, and awesome authentic Asian food and culture I never really checked out. When I go back each year, I promise myself I'll go downtown and explore, but I always run out of time. Frankfurt, Germany - amazing food! New Orleans is definitely tops on my list, too. I'd also say Charleston, but I get to go there almost every summer. Can't wait for this year's trip! Cape Town, South Africa. It is the most beautiful place I have ever been! I would love to go back to New Orleans and Las Vegas. I visited both when I was in middle/high school and I bet it would be a completely different trip now! I wish I could re-visit Savannah. I loved the city, but went with a college group for a conference and we weren't allowed to explore. I would love to visit Dallas again. My best friend and her husband live there, and the food scene is really growing! I would love to visit Key West again. My husband and I went there on our honeymoon, and it was wonderful! It was so laid back, and the food was just to die for. Really. I definitely want to revisit New Orleans but I have to say that first I must go back to Las Vegas. I went when I was 16 and while the shows (Beatles Love Cirque du Soleil, Phantom of the Opera) were good, going to bed by 11 (it was my mom, aunt, granny, and me) was not the Las Vegas experience that I want now that I'm older. I wish I could visit Chicago again. Like you, my trip was in college and I didn't understand what great food there was or where to find it. I mistakenly thought Chicago was only about deep-dish pizza! Chicago! I used to live within driving distance and got to visit once a year or so, and now I haven't been in nearly ten years and I miss it. London. I can't wait to get back to England. New York. I've only been once, and I feel like I barely scratched the surface! New Orleans, for sure. I'd also love to revisit Hong Kong. I would love to revisit new orleans. I go to NYC a lot and Ive been to NOLA once-- such a cool city! Mmm...I just had a brownie and gelato at Sucre on Friday night but I still haven't tried their macarons. The city I need to revisit is Portland. I would love to re-visit Nashville. I was there for a work conference a few years ago, but never really got to enjoy the sights. I'm a huge country music fan, so I'd love to go back and experience that aspect of it. I would love to revisit Seoul. I loved it! absolutely love love macaroons! i would revisit...nyc! San Fransisco-I was only there as an angry teen. I now realize how beautiful it is. Paris. I went when I was 6 years old and have vivid memories...but I so want to experience it again! Taos, New Mexico! A beautiful place which inspired Ansel Adams and Georgia O’Keeffe. 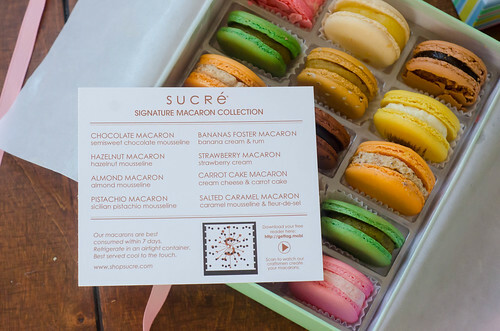 The Sucre macarons share a similar color palette. I'd love to revisit Madrid. If we're only talking domestic then I'd love to revist Portland, ME. I'd love to revisit both D.C. and NYC. (Oh, and I'd love to travel to Israel, Egypt and Iceland for the first time.) Thanks for the chance to win! I would love to go back to Sorrento. It's such a beautiful part of Italy! I would love to re-visit Scottsdale...went when I was really young and had no appreciation for the beauty of the desert at the time! I went on my honeymoon to New Orleans, and we would love to go back! I'm always up for NYC anytime, and would love to go back to Williamsburg, VA as well. Love traveling! I would love to go back to San Diego. I haven't been there since I was very little and I want to see it as an adult. I left my heart in San Francisco! I'd love revisit there soon! I'd love to go back to NYC Soon! I would love to revisit New Orleans or San Francisco. Rome...or Florence... I would love love love to go back! San Diego, I wasn't there long enough to really enjoy the city! I think Austin is the current top of my list! Either New Orleans or Chicago! After watching "Jiro Dreams of Sushi" on Netflix (Highly recommended) I would LOVE to go back to Tokyo and find that 10 seat sushi shop in the Ginza subway station. (Reservations needed a year in advance; dinner STARTS at $300/person! ; only Michiline 3 star restaurant with only 10 seats and no restroom in the store!) I lived in Japan for 7 years. I would revisit Savannah! I went there for a wedding right after law school, so I was broke. My money was spent walking around with frozen drinks all weekend, instead of enjoying the beautiful city! San Francisco is one of my favorite cities. I haven't been there in several years, but would love to go back. i'd love to revisit chicago. it's been years! Domestically San Francisco is my favorite US city to visit but internationally I'd love to go back to Istanbul. It's such a fascinating mix of cultures, food, and sights! I would love to see Tarpon Springs FL again! I would love to revisit Paris! Seattle! My dad and brother live out there and I love it so much! I would love to go back to Sedona, AZ. I want to visit New York, but if it's somewhere I need to revisit then Chicago. I'd love to go back to NYC! Right about now I am missing Boston and would love to visit. I would love to go back to Legrena, Greece. Or maybe somewhere closer like Auburn, Alabama or Manhattan, Kansas for school. Or Blowing Rock, North Carolina just to enjoy the mountain air. I would love to visit New York again. I want to go back to Chicago and New Orleands. I was born and raised in New York and think it's the greatest city there is. Being Italian...I'd dearly love to visit Rome (or any other city in Italy for that matter). I'd love to revisit Paris! I'd like to see New York again. I lived there for awhile but haven't been back in quite a few years! Hi, I do think this is an excellent website. I stumbledupon it ;) I am going to return yet again since i have bookmarked it. I would love to go back to Portland Maine! We visited on our honeymoon, and I didn't do research on any of the food beforehand. I'm sure we missed some amazing stuff. I have a huge list of cities I'd like to visit for the first time. However, I would also love to revisit Seattle. I would love to go back to San Diego. My husband took me there for my 25th birthday, and we had an amazing time! I went to NOLA recently and though I did a lot of good eating I somehow missed out on Sucre! I really want to revisit SF. Love it there! I would say New Orleans, but we're planning to go in August. So my second pick would be NYC. Lately I've been dying to go back. I would love to visit Toronto Canada again. It is a cutting edge city with plenty to do! I'd love to re-visit Jerusalem. It was beyond amazing! London...I lived there during my junior year in college, but like you so eloquently put it, I had different priorities back then. 10+ years later, I would love to re-visit with a new perspective. Naples, Italy..My husband and I met there and fell in love with the "real Italy" there. Portsmouth, NH on the east coast, Sonoma, CA on the west coast. Two of my absolute favorites! I would love to go back to Hong Kong, it's where my boyfriend and I met! Brussels! Best waffles and mussels ever . . .
Denver, CO has the best food trucks ever! I'd love to revisit Copenhagen! There are many on my list. I think Charleston, SC would be at the top. I went on a business trip there once and would love to go back and actually have time to explore the city. I'd love to revisit Chicago. We traveled there for a wedding a few years ago, and I'd love to return and explore a bit more. I would LOVE to go back to Maine and spend more time in Bar Harbor.....sooooo beautiful there!! I haven't been anywhere to revisit. I( would definitely like to visit Nashville TN, or Palmyra NY. Of course, I would just like to take a trip anywhere. I have been to Alaska, so I guess I would like to go back there. My favorite city of all time, Barcelona! Within the US, I'd love to go back to New Orleans, internationally, definitely Tokyo. I wish I could go back to New Orleans as well. I went the Spring Break after Hurricane Katrina and a lot of the city was still shut down. It'd be great to see it so many years later and experience all it has to offer. Amsterdam and I would just eat chocolate, cheese and those fries! I would love to re-visit San Francisco! Paris. It would be fun to go like an adult instead of a poor college kid. I would re-visit New Orleans also. Last time I was there I was only 4 years old, so I don't remember much, but the pictures look like I had a good time! Madrid, Spain! I lived there one summer during college, and it was so fun to explore! In the U.S., Washington DC. Overseas, Belfast. I would love to re-visit Seattle! Charleston for sure....I can't wait to go back some day!!!! US city: Washington DC, Foreign City: Munich. a perfect way? I've a venture that I'm just now operating on, and I have been at the glance out for such information. Paris...I want to see more of this city...especially when it's not pouring down rain! Washington DC and New York -- but this time in the winter and not the yucky, sticky summer! Portland, ME...it has an amazing foodie scene and I barely scratched the surface while there! I would love to re-visit Boston. I surprised my boyfriend with a trip there for his 30th birthday and we fell in love with the city. After all the tragedy there, I would love to visit and show my support for the city we love! I would like to revisit Paris - it's where I first fell in love with macarons! I would love to re-visit Rome. It was awe-inspiring, absolutely amazing. I would like to re-visit Boston. I went there before I became a true foodie! At the time I went I didn't even like seafood and now I am addicted to shellfish! I have only been to Seattle and I LOVED it. If I could go anywhere is New York or New Orleans though. I lived in Berlin, Germany for two years and would give nearly anything in the world to go back there. Its truly the best city! New York City, no matter how many times you go back, its still exciting. I would love to revisit Miami! Well come on down here to New Orleans Honey, just don't forget to look me up :) I think I'd like to revisit Boston. What a lovely place and I think my old boyfriend still lives there. But I wouldn't be seeing him! I would love to revisit Wurzburg as all my relatives are there! I woul love to revisit D.C. Haven't been since I was a child! New York tops the list... so much more to see and do! I would love to re-visit New York and San Deigo! I had a few hours in Edinburgh once, but I didn't get to see anything. I'd love to go back and do it right! I want to revisit San Francisco! I have been, but the visit was brief. And this time I want my husband there with me! Wish I could revisit Dubai! New York-- preferably during Christmas! Any city in Australia - I definitely did not appreciate the cuisine or wine when I spent a semester there in college! I would love to visit New Orleans again. I was there for only part of a day and would love to see more! I would love to re-visit San Francisco at some point. I have so many cities on my "need to visit" list: Boston, Seattle, and Austin are up there on my US list. There are way too many foreign cities to name. For my re-visit list, I'd probably put Miami toward the top. I only spent a weekend there a few years ago, and I was mostly focused on spending time at the beach. I'd like to explore the city more on my next visit. Charleston is also at the top of my re-visit list. Napa! I went this past fall for a wedding and there just wasn't enough time to see and do everything! Absolutely on my list to re-visit!